Fundamentals of Renewable Energy Processes contains the technical detail necessary to understand the engineering principles that govern renewable energy application at many different levels. Focused on the fundamental mechanisms and processes that underpin energy management, it provides students with the foundation for all energy process courses. This text is organized according to the main forms of energy – heat engines, hydrogen energy, energy from the sun, and wind and water energy - with an introductory chapter of basic energy terms. From fuel cells, electrolyzers, and processes for hydrogen production to biomass and windmills the author provides the most thorough examination of all aspects of renewable energy processes. 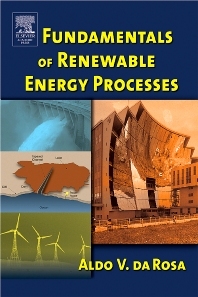 The book is recommended for all students and professionals studying the basic mechanisms of renewable energies. Examines the fundamentals of some non-traditional energy processes and illustrates the best way to implement these processes in our modern world. Appropriate for all students and professionals studying the basic mechanisms of renewable energies. Clear theory and physical examples of all principles relevant to the study of renewable energy.